After going goalless in the quarter-final, Ottawa 67’s right-wing Tye Felhaber lit up the score sheet in Game 1 versus the Sudbury Wolves, coming away with a hat-trick en route to an 8-5 victory. Eddie Powers Memorial Trophy winner Jason Robertson was the overtime hero for the Niagara IceDogs on Friday, icing the Oshawa Generals at the 4:14 mark of the extra session for a 3-2 win and an early 1-0 series lead. Deadline acquisition Owen Tippett guided the Saginaw Spirit to a 4-1 series-opening victory over the Sault Ste. Marie Greyhounds in which he finished with two goals and one assist, in addition to eight shots on net. 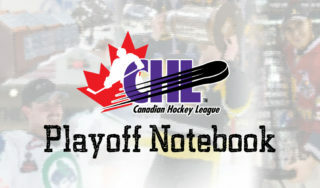 Two more assists by defenceman Evan Bouchard brought his playoff total to 12 points – tied with teammate Alex Formenton for first in OHL playoff scoring – and helped lift the London Knights to a 3-2 win over the Guelph Storm in Game 1. A three-goal outburst in the final frame, in which 2020 NHL Draft hopeful Alexis Lafreniere collected a point on each tally, carried the Rimouski Oceanic to a 3-1 victory in Game 1 versus the Cape Breton Screaming Eagles. Halifax Mooseheads forward Raphael Lavoie had the hot stick in the first round, and his production has now carried over versus the Moncton Wildcats as the draft-eligible right-wing wrapped up Game 1 with two goals and one assist en route to a 5-3 win that pushed his QMJHL-leading total to 16 points. 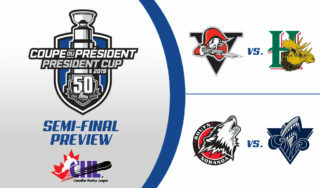 The Drummondville Voltigeurs pounded the Sherbrooke Phoenix in Game 1, ending in a 9-4 final that saw eight skaters finish with multi-point nights for the winning side, including Anaheim Ducks prospect Maxime Comtois, who had two goals and one assist. 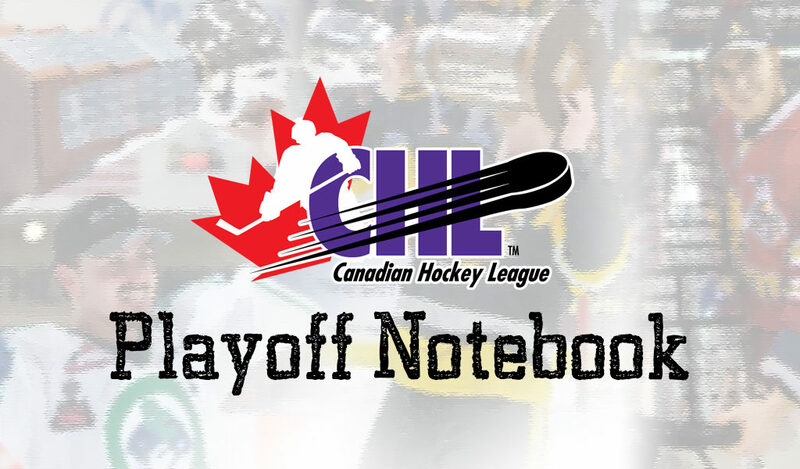 A 23-save shutout by goaltender Samuel Harvey lifted the Rouyn-Noranda Huskies to a 4-0 win in Game 1 versus the Victoriaville Tigres on Friday. 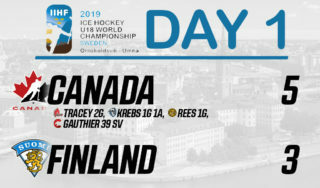 Draft-eligible right-wing Brett Leason collected one goal and three assists in the Prince Albert Raiders‘ 6-1 win in Game 1 versus the provincial rival Saskatoon Blades. 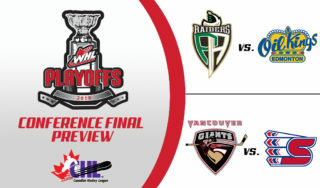 Vancouver Giants netminder Trent Miner saw just 15 shots, but turned them all aside en route to a tidy 3-0 series-opening victory against the Victoria Royals.